BlackBerry World (previously BlackBerry App World) is an application distribution service and application by BlackBerry Ltd for a majority of BlackBerry devices. The service provides BlackBerry users with an environment to browse, download and update third-party applications. The service went live on April 1, 2009. Of the three major app stores of different operating systems, it has the largest revenue per app at $9,166.67 compared to $6,480.00 and $1,200.00 by the Apple App Store and Google Play, respectively. On 21 January 2013, BlackBerry announced that it rebranded the BlackBerry App World to simpler BlackBerry World as part of the release of the BlackBerry 10 operating system. The BlackBerry Priv, the newest BlackBerry phone which runs Android, uses the Google Play Store. In 2003, RIM launched the Mobile Data Service to enable customers to access Java-based third-party enterprise applications using the secure real-time push-based BlackBerry infrastructure. Later on October 21, 2008, RIM announced at the BlackBerry Developer Conference that the company would open an application store for their devices. It was also announced that the store was scheduled to be open in March 2009, and would work in conjunction with PayPal's services. On January 19, 2009, RIM began accepting submissions of applications from developers. On March 4, 2009, RIM officially named the store "BlackBerry App World" (previously called the BlackBerry Application Storefront). It was also confirmed that the service would not initially be available for desktops, and only a web-based catalog would be accessible from non-BlackBerry devices. On April 1, 2009, at CTIA's trade show, RIM announced that App World had gone live. At the BlackBerry sponsored Wireless Symposium, it was announced that an average of one million apps were being downloaded each day. On August 19, 2010, BlackBerry App World 2.0 was released. This new version introduced BlackBerry ID - a single sign, account system that can be used on both the BlackBerry client and the BlackBerry App World desktop storefront. In addition to BlackBerry ID, BlackBerry App World 2.0 also introduced direct credit card billing and carrier billing for AT&T Wireless subscribers. On December 3, 2010, Research in Motion announced that daily downloads were two million apps per day. On February 2, 2011, BlackBerry App World 2.1 was released. This version introduced in-app purchases of digital goods, allowing for add-ons to be purchased within applications. On January 21, 2013, BlackBerry rebranded the BlackBerry App World to simpler the BlackBerry World. On June 18, 2014, BlackBerry announced an official relationship with Amazon, which includes access to Amazon Appstore in BlackBerry 10.3. At the beginning of 2011, 16,000 apps were available on BlackBerry App World. A year later, the app store passed 60,000 apps (January 2012) and a month later 70,000 apps (February 2012). At BlackBerry Jam in September 2012, RIM announced that App World had more than 105,000 apps. In May 2013, at the Blackberry Live Conference, BlackBerry announced that over 120,000 apps for BlackBerry 10 where available to download from BlackBerry World. Application verification is done for BlackBerry World apps about content and quality before is agreed to launch. About 85 percent of the verification is done in Denpasar, Bali. RIM announced that the store would initially be available in the United States, United Kingdom, and Canada. As of March 2013 - BlackBerry World is available in 170 markets and supports 23 currencies and 33 languages. Over 6 million applications are downloaded daily with an aggregate of over 4 billion downloads to-date and accepts payment in all markets using a combination of PayPal, credit card, and carrier billing. List of countries where BlackBerry World is available. Applications are both free and paid from $0.99 to $599.99 USD in the U.S. The registration and app submission fees charged to developers are currently $0. The service is available in English, French, Italian, German, Spanish, and Brazilian Portuguese. Users were initially allowed to archive their apps on a MicroSD or on eMMC storage of certain BlackBerry smartphone models. The archive function was later removed with the release of App World 3.0. In 2010, RIM announced several new tools to make it easier for applications developers to build, simulate, deploy and monetize feature-rich applications on the BlackBerry platform including the BlackBerry Enterprise Application Development Platform; the next generation BlackBerry Web Application Platform; BlackBerry WebWorks Platform for the BlackBerry PlayBook™ Tablet and BlackBerry smartphones; and BlackBerry Payment Service, BlackBerry Push Service, BlackBerry Advertising Service, Location Service, Maps Services, Analytics Service, Scoreloop, BBM Social Platform Software Developer Kits, et al. BlackBerry embraced open standards and included a variety of open source libraries out of the box including Lua, OpenAL, cocos2d-x, and Box2D and has an open source repository that can be accessed at github.com/blackberry. This open ecosystem helps developers target multiple platforms through partnerships with Appcelerator, Cordova, dojo, jQuery Mobile, Marmalade, NME, Qt and Sencha Touch. BlackBerry has changed its whole direction of development tools and is now mainly embracing their C++/Cascades as the "native" road to develop mobile apps for their BlackBerry 10 platform. HTML5 is considered the almost-native second path for development. In April 2014 BlackBerry has announced to stop the support of Adobe Air with the release of BlackBerry 10.3.1 to be released later 2014. From the time of the release of BlackBerry 10.3.1 it will not be possible to upload new Adobe Air-based apps to BlackBerry World. ↑ "BlackBerry World Download Versione 4.3.0.26". BlackBerryItalia.it (in Italian). Retrieved 21 February 2013. ↑ Eric Zeman (February 28, 2011). "BlackBerry App World Generates Highest Revenue Per App". Bacononthego.com. Retrieved May 5, 2011. 1 2 "BlackBerry App World Web Storefront is now BlackBerry World". BlackBerry. Retrieved 21 January 2013. ↑ Perez, Marin (2008-10-21). "RIM Announces BlackBerry App Store". InformationWeek. Retrieved 2009-03-09. ↑ Meyer, David (2009-01-29). "BlackBerry app store open for submissions". CNET News. Retrieved 2009-03-09. ↑ Cha, Bonnie (2009-03-04). "RIM store crowned BlackBerry App World". Crave. CNET News. Retrieved 2009-03-09. ↑ Mies, Ginny (2009-04-01). "BlackBerry App World open for bousiness". Macworld. Retrieved 2009-04-02. ↑ O'Brien, Stuart (2010-04-27). "BlackBerry App World generating 1m downloads a day". Mobile Entertainment. Retrieved 2011-01-13. ↑ unknown (December 3, 2010). "BlackBerry App World hits 2M daily app downloads". GSMA Mobile Apps Briefing. Retrieved December 3, 2010. ↑ Jason Cipriani (2011-02-02). "BlackBerry App World 2.1 now available for download, brings in-app purchasing". Dennis Publishing. Retrieved 2011-05-31. 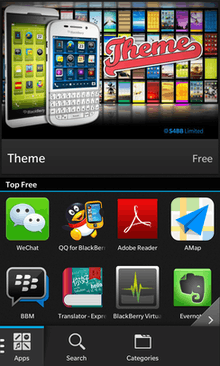 ↑ "Kantor Pusat BlackBerry World Ternyata di Bali". July 20, 2013. ↑ Research2Guidance. "Smartphone App Market Monitor vol 7". 1 2 3 4 "BlackBerry App World Doubles Downloads in 6 Months". BerryReview. Retrieved 2011-03-23. ↑ "BlackBerry App World crosses over the 1 billion app download mark, 3 million downloads per day". MobileSyrup. Retrieved 2011-07-12. ↑ "BlackBerry App World Stats: Over 2 billion downloads; 60,000 apps available". CrackBerry. Retrieved 2012-02-07. ↑ "RIM marks three billion BlackBerry app downloads, wants to set the record straight about App World". Engadget. Retrieved 2012-07-08. ↑ "Archived copy". Archived from the original on 2014-02-18. Retrieved 2014-04-23. 1 2 "BlackBerry App World FAQ". Research In Motion. Retrieved 2009-03-09. ↑ "BlackBerry World Availability". Retrieved 31 January 2014. ↑ "BlackBerry App World Vendor Support". Research In Motion. Retrieved 2011-05-31. 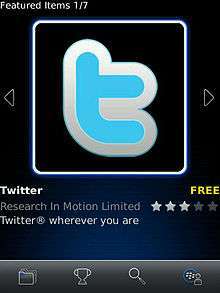 ↑ "New Features of BlackBerry App World 1.1". Retrieved 2010-03-19. ↑ "Overview of archiving applications in BlackBerry App World". BlackBerry. Retrieved 9 February 2013.